Slash has collaborated with Gibson on 28 signature Les Paul models: 14 through the Gibson Custom Shop, 6 through Gibson USA and 8 through the Gibson subsidiary Epiphone. 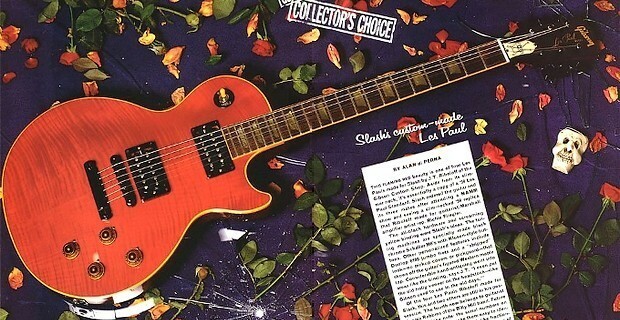 Notes: This is the very first Gibson Les Paul made only for Slash, no production release. Slash ordered these four guitars after attending a NAMM show and seeing a slim-necked '59 replica made by J.T. Riboloff of the Gibson Custom Shop. The all-black hardware and screaming yellow binding were his ideas. Other personalized features include Dunlop 6100 jumbo frets and a "stripped" look with no pickup covers or pickguard. Of the four Les Pauls Riboloff made for Slash, three are still in his possession. The fourth, the one being auctioned, he traded for another guitar in the Gibson vault. Notes: Slash received the first four including the prototype, the only one with the carving on the body turned 90 degrees to be viewed right side up when displayed on a guitar stand. In 1998 Slash's studio was broken into and his guitars were stolen, including the Snakepit prototype, so the Gibson Custom Shop built him a replica. The first 50 have a certificate that says "limited 50 pieces", but the production was increased to 100 pieces. These guitars are by far the rarest and most collectible of any of the Slash Signature Les Pauls. Notes: This guitar features a plain maple top with a Dark Tobacco Sunburst finish, and has a piezo pickup with a switch located near the tone and volume knobs. It comes with signature hardcase and black certificate of autenticity in leather pocket. Slash mainly used this Les Paul Signature on tour with Velvet Revolver. Notes: This model comes with signature hardcase and black/red certificate of autenticity. Notes: Here is an authentic replica of one of two Les Pauls Standard Slash received from Gibson in 1988. It features a carved 3 piece maple top, one-piece mahogany back, and rosewood fingerboard, with a Heritage Cherry Sunburst finish faded just like Slash's original. It comes with signature hardcase, black certificate of autenticity in leather pocket and leather Slash jacket. Notes: A series of Signature Les Paul Standard VOS Signature aged by Tom Murphy to resemble the original guitar as it is today. The first 50's are signed by Slash in gold marker on the back of the headstock. It comes with signature hardcase and black certificate of autenticity in leather pocket. Notes: This one was modeled after a 1991 Gibson Les Paul Goldtop that was stolen from Slash's collection in 1999. It features a mahogany body and a hand-carved maple top with Gibson's classic Bullion Gold finish. Comes with signature hardcase, yellow certificate of autenticity and leather holder. Notes: This model resembles the original Les Paul Standards of the late '50s, including the 1959 Les Paul replica Slash used for the recording of most of his albums. It has a maple top with a nitrocellulose Sunburst finish, rosewood fingerboard with mother of pearl inlay and a Slash headstock graphic. Notes: Les Paul Appetite For Destruction VOS (Vintage Original Specifics) is a replica of the 1959 Les Paul Standard replica built by Kris Derrig and that Slash mainly use in studio since 1987. Notes: A series of Signature Les Paul Appetite For Destruction VOS aged to resemble the original guitar as it is today. There're all signed by Slash himself. Notes: This one was modeled after a Gibson Les Paul AFD red prototype that Slash used on tour back in 2013. It blends timeless specs with Slash-approved features and fine points all dressed in a brand new finish Rosso Corsa. Notes: Another Slash Signature guitar modeled after the Gibson Les Paul AFD. This time with a striking Vermillion finish. Notes: After touring with his prototype models throughout 2016 and 2017, Slash announces the release of these limited edition Gibson Custom Slash Anaconda Burst Les Pauls. All the Flame Top models are signed by Slash. Notes: After touring with his prototype models throughout 2016 and 2017, Slash announces the release of these limited edition Gibson Custom Slash Anaconda Burst Les Pauls. The first 25's Plaine Top models are signed by Slash. Notes: This model was manufactured by Gibson U.S.A. few mounths later. 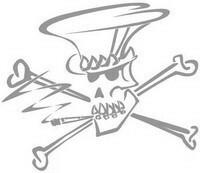 The first 50 pieces are hand-signed and numbered by Slash himself. Notes: This model is a radical departure from the Les Pauls Slash is known for, yet he wanted many Les Paul elements included on this model including humbuckers, historic Les Paul wiring and pickup spacing, and a solid figured maple cap. All the White models are signed by Slash. Notes: This model is a radical departure from the Les Pauls Slash is known for, yet he wanted many Les Paul elements included on this model including humbuckers, historic Les Paul wiring and pickup spacing, and a solid figured maple cap. Notes: Gibson confirm Slash's original 1958 Les Paul guitar was one of the first two sunburst Les Pauls ever made. Even if Slash didn't use it on stage or in studio, they decided to make a copy of it. Notes: A series of Signature Les Paul First Standard aged to resemble the original guitar as it is today. The first 50's Plaine Top models are signed by Slash. Notes: This model is the result of a collaboration between Slash and the artisans at Gibson Custom Shop to create the ultimate Les Paul Standard based on Slash's favorite specifications and appointments. Each is hand-signed and numbered by Slash himself.